I would love to give a great big THANK YOU to all of you who sponsored me in the Pro-Am Face Off for Alzheimer's! My goal was to raise $5,000; however, with your incredible support, I was able to raise $6,255 for this worthy cause! My team, Team of the Century, had a goal of $25,000. Together, we brought in $41,900! I would like to thank everyone for their extreme generosity. Together, we will keep memories alive. Today 747,000 people in Canada are living with some form of dementia. 64% of these people are suffering from Alzheimer’s. The average life expectancy of those diagnosed with this debilitating disease is 8 years. (©Alzheimer Society of Canada 2011). Currently there is no cure. Alzheimer’s is fatal. We need to stop this disease, and put an end to this degenerative cycle. Please help me “Stick it to Alzheimer’s” by sponsoring me in the Pro-Am Face Off for Alzheimer’s hockey tournament. DONATIONS MUST BE IN BY 4:00pm TODAY! HELP ME "STICK IT TO ALZHEIMER'S"
2 DAYS LEFT TO HELP "STICK IT TO ALZHEIMER'S"
2 days left before the cutoff date to sponsor me in the Pro-Am Face Off for Alzheimer's Hockey Tournament! All donations must be in before Wednesday, April 24, 2013. 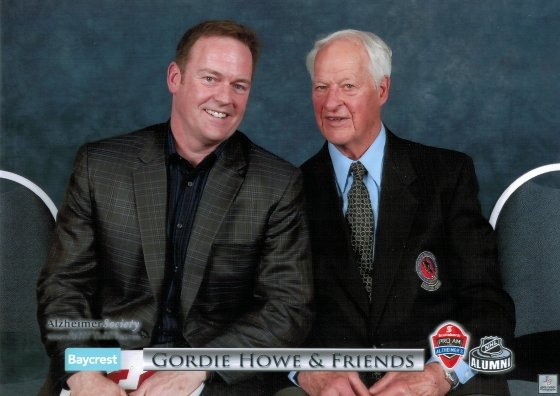 Here I am at last year's tournament with former Flames Captain Jim Peplinski. Please show your support and donate. Help us "Stick it to Alzheimer's!" We need to stop this disease, and put an end to this degenerative cycle. 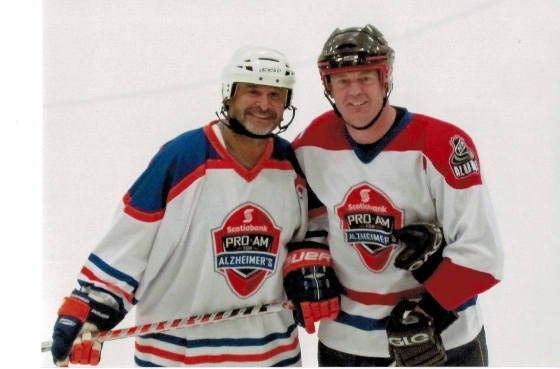 Please help me “Stick it to Alzheimer’s” by sponsoring me in the Pro-Am Face Off for Alzheimer’s hockey tournament, taking place April 27th & 28, 2013. Proceeds from the tournament will go towards the Alzheimer Society of Alberta and Northwest Territories and will provide much-needed funding for dementia research. Please check out my donation page at http://my.e2rm.com/personalPage.aspx?registrationID=1777027&langPref=en-CA . All donations need to be in by 4:00pm on Wednesday, April 24, 2013. Any amount will help. Do not let yourself fall amongst the forgotten. Please help me "Stick it to Alzheimer's". I have listed a new property at 16 9703 174 ST in EDMONTON. Incredibly convenient location for this SPACIOUS EXECUTIVE TOWNHOME. The main floor features rich natural OAK HARDWOOD floors in the large living and dining room, a cozy gas fireplace, ample kitchen cabinets with a large dinette that features a terrace door leading onto a private sundeck. The second level boasts 2 VERY LARGE BEDROOMS with newer laminate flooring. The master has 2 double closets and a large 4pc ensuite with a double person soaker and separate shower. The basement level is fully finished and has a laundry/furnace room, office/den and entrance to the attached garage. Close to all amenities, Shopping, Restaurants,Lake and Public Transportation only steps away!!! I have listed a new property at 918 HOPE WAY in EDMONTON. LOCATION! LOCATION! LOCATION! BEAUTIFUL 2,173 s.f. 2 storey located in prestigious COPPERWOOD in THE HAMPTONS. Large windows & vaulted ceilings brighten the entrance making this elegant home warm & inviting. Cozy den offers a quiet workplace & a seat with a view. Rich, dark hardwood leads homeowners and guests through to the spacious, high end kitchen. SS appls, granite countertops, ample cabinets, & generous counter space make this kitchen a chef's dream. All overlooking the spacious living rm. Open staircase leads to a spacious, functional 2nd level. Huge MBR w/ a 5 pc Jacuzzi ensuite. 2 secondary bdrms are joined by a 5pc Jack-&-Jill & separate walk-in closets. Individual sinks make for stress-free mornings for parents. The private west facing fully fenced backyard has a maintenance-free deck making this the perfect spot for summer night BBQs. Though elegant for entertaining, this GORGEOUS home offers all the functionality needed to make this the PERFECT FAMILY HOME! I have listed a new property at 1103 10010 119 ST in EDMONTON. Live the URBAN life in this EXECUTIVE downtown HIGH RISE apartment. This 11th floor 2,130 s.f. unit boasts a spacious dining room, and large living room, perfect for entertaining. HUGE master bedroom with three piece ensuite. 2nd bedroom & 4 pc bathroom. In-suite laundry & a den. Generously sized rooms make downtown living comfortable and luxurious. The SW exposure balcony has breathtaking views of the River Valley, making this the perfect spot for summer get-togethers! Enjoy the sunlight year round as floor-to-ceiling windows throughout the condo brighten the unit with natural light. Gorgeous views of either DOWNTOWN EDMONTON, or the RIVER VALLEY from every room. Easy access to shopping, schools, and public transportation. Located in the HEART OF DOWNTOWN Edmonton. Enjoy downtown summer festivals and all the City has to offer!!! Join Edmonton's nightlife scene! Downtown Edmonton's finest restaurants and pubs all just minutes away! Perfect for the individual craving URBAN LIVING!!! I have listed a new property at 305 11220 99 AVE in EDMONTON. Two storey "penthouse" (top two floors), in premium concrete building: The Galleria - noted for its award winning architecture and interior atrium. Two large bdrms and two full baths. Main level has one bdrm with adjacent bathroom, dining room with 16' ceiling, kitchen and small storage rm; top floor has the living rm w/ large windows and wood burning fireplace, concrete "bridge" to master suite w/ walk in closet and 4pc ensuite. Two balconies --exterior deck-like balcony facing west, and interior balcony overlooking the plant filled atrium. Kitchen features granite countertops and stainless steel appliances. Unique concrete floors throughout w/ laminate in both bdrms. All new windows in 2011. Insuite washer and dryer. Additional, large storage rm in parkade. Two underground parking stalls and ample underground visitor parking. Excellent, quiet Oliver location, close to river valley, 2 blocks to LRT, pets allowed w/ Board approval. Close to Jasper Avenue, Downtown, Gov't centre, and both Universities. I have listed a new property at 1102 Highland Brae DR in MULHURST BAY. A PRIVATE OASIS PARADISE on Mulhurst Bay at Pigeon Lake. This immaculate 1350 s.f. custom built 1.5 storey country home offers a wonderful open design. A huge executive master suite, spacious living and dining area with 23 ft vaulted ceilings, beautiful new laminate throughout, new exterior Pella doors, new furnace, new hot water tank, new roof (2006), new pressure tank, new stainless steel appliances, front load washer & dryer, custom wainscoting, renovated oak kitchen with farm house sink, newly renovated bathroom, new water filtration system, roughed in alarm, upgraded lighting, 2 ADDIDTIONAL GUEST CABINS, A HUGE OVERSIZED TRIPLE GARAGE, RV AND GUEST PARKING, a large private fire pit area, 3 large storage sheds and SO MUCH MORE!!! The perfect lake get away for relaxing alone or entertainng lots of family and friends!!! To include some furnishings, all beds in bunkhouse and main building. I have sold a property at 5712 141 ST in EDMONTON. Fantastic Brookside location for this Former Executive showhome. Very spacious floor plan perfect for formal entertaining. Very bright and sunny huge corner lot facing Whitemud Creek Ravine and nature trails. I have listed a new property at 105 10320 113 ST in EDMONTON. Excellent Location in the Heart of Downtown... SPACIOUS 882 s.f. 2 Bedroom, 1 Bathroom Unit located on a quiet street with Mature Trees. Beautifully upgraded... remodelled Bathroom, NEWER flooring, NEWER Light Fixtures, NEW VINYL WINDOWS throughout entire building, Security System, HUGE Insuite Storage... Condo Fees include all Utilities and Free Laundry. Across the street from Oliver Square Safeway and shopping. Steps away from MacEwan University and Jasper Ave. Bus and LRT are just around the block. Perfect for Students, Professionals and Investors. Great Opportunity! Ready to move in! I have listed a new property at 5712 141 ST in EDMONTON.